I have heard that it is not a good idea to try raising 2 GSD pups from the same litter. They are already play/fighting like siblings do, but some of their fights are becoming more aggressive......fighting for dominance. I am also worried about them biting at each others ears, causing them not to go UP like they are supposed to. They are almost 3 months old, and I almost gave one away this past wknd, but just could not choose between the 2.....so I brought them back home. I do not want to separate them, and/or keep one in a crate, and the other in the yard, or vice versa. That just seems cruel. Do you have any suggestions, or have a made a huge mistake in keeping them both. They are male and female, and both getting fixed in about a month. Comments for Raising 2 German Shepherd puppies from the same litter?? I have three GSD's and they each have their own kennel, crate, or den, whichever you prefer to call it. There is no reason that they cannot have personal time in their own space. They should have individual training and together training, and just like with children don't be afraid to tell your puppies "no", they will still love you. One of my shepherds ears did not go up, and two did, and none of them are from the same litter. However, two from the same litter are no different from any two dogs, they have their own language, and you must be the pack leader. Good luck, and we personal love our shepherds and they love learning new tricks. My wife and I have 2 males now 7 months old. 1 of them has definately become the dominant of the 2. We are concerned now because the less dominant puppy is getting very thin. The vet assures us he is not sick in any way. We suspected that the dominant puppy was intimidating him out of his food. We have begun feeding them separately in order to eliminate this possibility. The less dominant puppy continues to loose weight and it is very concerning to us. The dominant puppy also is constantly biting at the other puppy's hind legs. Is this normal or something we need to take steps to eliminate? Is the dominant puppy intimidating the other dog when we are not around? or could there be another explanation for this? Please advise us on how to proceed, we are both very concerned for the puppy loosing weight. I am raising litter mates, 1 male and 1 female. They are each other's best play toys and yes they play fight alot! I can honestly say I have only occasionally heard one of them cry when playing. They are now 8 1/2 months old and they are still full of energy, and yes they are much better behaved when tired! My female is the dominant one and has wrecked her brothers' ears unfortunately. When they fight she will drag him to the ground hanging on to an ear! I have attempted taping his ears with the instructions on this site and she has "assisted" him with removing the tape every time! I can live with a flop-eared Shepherd, not a huge deal. I just could not see putting a muzzle on her. I guess knowing what I know now, I would have put a divider in the pen they share so they can have a little bit of alone time. 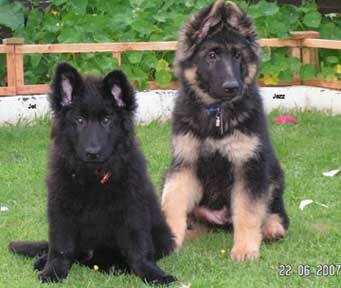 I have 2 GSD puppies, male and female from different litters. (9.5(M) and 11(F) weeks.). When I got him at 8 wks old, one ear was standing up and the other was 1/2 up. They have been wrestling/play-fighting a lot. Now both of his ears are down; her ears are not up yet as well. Will I need to glue the ears for them to stand up? Thanks. I am also raising two 6 month old litter mates - male and female. They are a handful but I have no regrets. Training them at the same time has been a challenge. During their initial puppy class, the female became very protective of the male and was aggressive towards other dogs that he came in contact with in class. We need to move to the next level of training but I am reluctant to have them in the same class although for convenience sake that is preferred. She behaved best when her brother was not in the class (my daughter and I usually take them together). Should we forge ahead and take them both at the same time or would it be best to take them separately? Hi. It's certainly not uncommon for someone raising litter-mates together. We've done this once, and now doing it again. We have two male GSDs' at 14 wks. The only thing that I have had issues with is seperation anxiety when one was taken from another. But that's probably common with any two puppies thats been together either litter-mates or not (it will somewhat go away after they get a litte older). It's a little challenging, but fun. I've done this in the past with two other litter-mate GSDs' (about 13 yrs ago and just had to put down our 13 yr old named Sebastian. His litter-mate, Rex, died at an early age from an unknow type illness. We miss them both terribly). Anyway, one will always be the alpha. And at time will challenge each other. But with good obedience training, this should not be a huge factor. I'm in favor of raising litter-mates and enjoy their love, friendship and loyalty. Good luck. raising 2 littermates, THX for your advice, Debbie. Thank you so much, Debbie for your advice. I was thinking about getting them into a puppy training class, as well. They do play well together and seem to love to have each other as company. They snuggle up every night, touching while sleeping. I must have mistaken their aggressive play fighting for it to be, fighting for dominance. This helps me alot, and will play play play with them more, since I do notice they sleep and dont bite on each other as much when I wear them out!! The other concern, was what I have been reading, on many sites, that their rough play also includes them biting on each others ears. I am hoping theirs will eventually stand up on their own. I appreciate your link on here, showing me how to tape them up. Its very hard to separate the 2 and not let them play with each other, even though they bite on the ears, face, neck, etc......with any luck, I wont have to tape them up! Thank you again, I am so relieved that I can actually keep them both, and have happy, healthy pups! I'm not quite sure where you heard that about raising littermates together being a bad idea - must be an old wives tale. I can tell you from experience that I have raised littermates together on more than one occasion, in fact I own a pair of 9 1/2 year old German Shepherd littermates (sisters) right now and they do fine together and always have. I wouldn't generalize all dogs based on any saying because you can't since each one of them is just as unique an individual as each of us human beings are, however I can tell you that once you get them fixed that that may cut down on some of the animosity - which overall is just sibling play and think about it - they are around each other a lot and thats enough to make even the most even tempered among us cranky once in a while. I would highly encourage you to get them both enrolled in a puppy class as soon as possible to help learn how to train them and maybe some methods to keep them from fighting so much plus training is good brain food for those developing GSD puppies as well as a great way to socialize them with other people and dogs. I can tell you this, if they have enough energy to fight (even if it's play) then they're simply not getting enough exercise. Puppies have loads of energy - get those guys out and simply wear them out - play, play, play - and I'll bet you see the level of fighting between them drop off significantly. Remember this as your new mantra - a tired puppy is a happy puppy, a tired puppy is a happy puppy, a tired puppy is a happy puppy...... Hang in there.